Hard-wired configurations are most popular during new construction projects or for homes and businesses where it is easy to run wiring to the various locations where the owner wants to install leak sensors (unfinished basements, crawl spaces, etc.). Hard-wired systems are very reliable, economical, and do not require battery replacement. They require more installation labor time as wire needs to be run from the control panel to the sensors. Our pre-packaged, hard-wired, residential systems come with 3/4" or 1" valves, though larger valve sizes are available. The valve is installed on your main incoming water line to your home. The control panel can be installed anywhere in your home or business that is convenient for you to access and that you can run wire to. 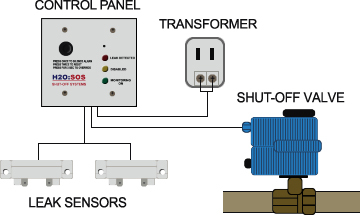 Power is obtained from a standard electrical outlet using the supplied 24 volt AC transformer. If one of our standard packages does not meet your needs, you can build your own H2O SOS leak detection system.